As we all know monoclonal antibodies are secreted by hybridomas in which mouse B cells are fused with myeloma cells, and their murine resistance is inevitable. It is envisioned to create a human antibody that reduces or avoids murine resistance. In 1990, John McCafferty demonstrated that the variable region of the antibody can be displayed on the surface of filamentous phage, which laid the foundation for the emergence of recombinant antibodies. In recent years, the use of recombinant antibodies is becoming increasingly wider and deeper in both therapeutics and diagnostics. With significant advantages over conventional antibodies, recombinant antibodies become more and more favored. So what are the advantages of recombinant antibodies? Why are they so popular? Maybe we should start with what an antibody is, its chemical nature, antigen-antibody reaction, biological functions, classification, production, application, etc..
On the basis of a general understanding of antibodies, now let's talk about recombinant antibodies. A recombinant antibody is a small branch of an antibody. In the article, we will introduce recombinant antibodies from five aspects, including definition, classification, production, advantages, and application. 1. What is a recombinant antibody? Antibody therapy has not achieved the desired results due to the drawbacks of monoclonal antibody agents in clinical applications. However, with the further understanding of the structure and function of antibody gene and molecular biology, the scientists have developed a new type of antibody. These novel antibodies are recombinant antibodies. Recombinant antibodies are a type of monoclonal antibodies which are produced in vitro by using synthetic genes. Differently, monoclonal antibodies are generated in vivo of living animals through hybridoma technology. The principle of the chimeric antibody is that the mouse-derived variable region sequence is inserted into the containing expression vector in a constant region of a human antibody. It has the specificity and affinity of the mouse antibody binding antigen, and at the same time, it reduces the immunogenicity of the murine antibody to the human body. 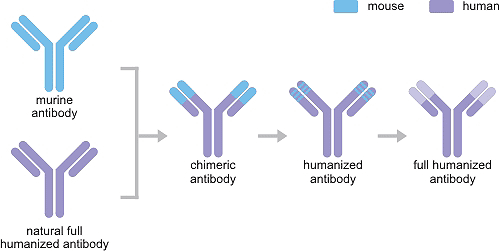 A humanized antibody means that the constant region of the antibody (CH and CL regions) is encoded by a human antibody gene. The humanized antibody substantially retains the affinity and specificity of the parent mouse monoclonal antibody, and can greatly reduce the immune side effects caused by the heterologous antibody on the human body. A fully humanized antibody refers to a human antibody gene that is transferred to a genetically engineered antibody gene-deficient animal by transgenic or transchromosomal technology so that the animal expresses the human antibody and gets full humanization of the antibody. The antibody itself cannot directly dissolve or kill target cells with specific antigens, and usually requires complement or phagocytic cells to exert effects to remove pathogenic microorganisms or cause pathological damage. The so-called antibodies are full-length antibodies, including the full length of the light and heavy chains. Due to the relatively large molecular weight of the full-length antibody molecule, problems such as poor tissue permeability and easy degradation are often encountered in practical applications. To solve these problems, scientists have developed antibody fragments with small molecular weight and strong binding, such as Fab fragment, single chain variable fragment (scfv), single domain antibody (sdab). The Fab fragment was originally defined as one of the cleavage products after treatment of rabbit IgG with papain, which cleaves the core hinge, resulting in two identical Fab fragments and intact Fc. The Fab fragment retains the antigen-binding region and has a molecular weight of one-third of the full length of the antibody and has good tissue permeability. At the same time, it has low immunogenicity due to its lack of Fc segment and is often used as a guide drug carrier and development. The single-chain variable fragment (scfv) molecule combines the coding sequence of the variable heavy chain (VH) and the sequence of the variable light chain (VL) domain of the antibody in a single gene coding format. Since the single-chain variable fragment antibody retains the variable regions of the full-length antibody light and heavy chains, its antigen-binding site does not change and thus still has good binding specificity. In addition, the polypeptide linker of a single-chain antibody can be designed into other sites such as metal chelation sites and linked drug sites as needed and is a powerful tool in clinical applications. Multivalent antibodies are antibodies that bind multiple antigens. At present, more attention is paid to "bispecific antibodies", which is an artificial antibody contains two specific antigen conjugate site that can build a bridge between target cells and functional molecules, thus producing directional effect role. The production of recombinant antibodies can be divided into five steps: the construction of antibody gene library, phage display, the separation of antibodies, the modification of the isolated antibodies, and the scaling up of the production of selected antibodies in the cell culture expression system. Antibodies are Y-shaped molecules composed of heavy and light chains, each with a variable region and a constant region. Variable regions of heavy and light chains are responsible for antigen binding. Antibody gene libraries are collections of microorganisms that have been genetically transformed with variable regions of different antibodies. Variable region genes can be amplified in vitro or from genetic material in B cells that produce human antibodies. The variable region gene is used to replace the gene of the complete antibody molecule, because the antibody fragment is easier to assemble in the microorganism than the complete antibody molecule, and the variable region of the antibody is the most important fragment in terms of function. Phages are viruses that infect bacteria and are made up of packages of DNA or RNA genomes in the outer layers of proteins. They contain "foreign" pieces of DNA and replicate in E. coli. Phage display differs from the conventional expression system in that exogenous gene sequences are spliced into one of the phage shell proteins so that exogenous amino acid sequences are genetically fused with endogenous amino acids of the shell proteins to produce heterozygous fusion proteins. On the phage display platform, the antibody variable region gene is often fused to the gene encoding the phage surface protein and presented as a fusion protein on the surface of the phage. The modified phage infects the bacteria, and the carrier and the phage work together to destroy the normal activities of the bacteria so that the bacterial cells start to produce new phage, which contains the antibody gene and displays functional antibody fragments on the surface. When the hybrid protein is released from the cell, the heterozygous protein is incorporated into the phage particle or virus particle to display the foreign peptide or protein domain on the surface. Once recombinant antibodies are shown, paramagnetic beads, fluorescently activated cell sorting (FACS), or enzyme-linked immunosorbent assay (ELISA) can be used to isolate individual antibodies that bind to specific antigen targets. The antigen of interest is incubated with the microorganism displaying the antibody and the recombinant antibody that does not adhere to the antigen is discarded. The binding rAb is removed from the antigen and the desired characteristics are screened. Promising antibodies grow in larger quantities and are then selected again to enrich the highest performance candidates. If the affinity of candidate is not strong enough, then the antibody can be "matured" by random or reasonable mutagenesis. Antibody affinity maturation is a process that occurs naturally in the body. The researchers used a similar in vitro process to produce recombinant antibodies. Molecular biology techniques such as site-directed mutagenesis, error-prone PCR, DNA shuffling, or bacterial mutant strains can be used to mutate selected residues of a given antibody fragment, resulting in entirely new libraries that can be tested for increased function. Once the desired antibody is selected, the gene for the antibody is transferred by the expression vector to the expression system - a bacterial, yeast or mammalian cell line specifically designed to express foreign proteins. The choice of vector and expression system depends on the type of antibody to be produced. Full-length antibody expression is most commonly found in yeast and mammalian expression systems. Bacterial expression systems are fast and cheap but are mainly used to express fragments. Compared with traditional antibodies, recombinant antibodies have the advantages of being irresistible, which is one of the reasons for their gradually emerging. Since recombinant antibodies are produced from a specific set of genes, the production of antibodies is controllable, and in theory, recombinant antibodies against any antigen can be constructed. At the same time, it is also possible to avoid, for example, gene deletion, gene mutation and cell line drift caused by hybridomas. This results in very small batch-to-batch variations, giving you highly repeatable results. Using recombinant techniques, antibody specificity and sensitivity are more easily improved by antibody engineering. The selection process for the desired clone occurs at the stage of hybridoma and recombinant cloning, allowing us to select the most favorable antibody quality. Once an antibody library is established, recombinant antibodies can be produced in as little as eight weeks. Recombinant antibodies derived from synthetic or human antibody libraries are completely non-animal techniques. This alleviates animal ethical issues associated with traditional monoclonal antibody production (animal immunization, euthanasia and ascites hybridoma amplification). The sequence of the recombinant antibody can be modified to suit the specific needs. Once the desired antibody fragment is found, it can be readily converted to any antibody isotype from any species by the addition of an appropriate constant domain. However, we also need to recognize that there are several obstacles to the production of recombinant antibodies, such as lower antibody production, and highly trained and experienced technicians. Due to the complexity and intensive high technology of recombinant antibody production, most scientists need to obtain them from outsourcing companies. Antitumor: The recombinant antibodies are mainly used in liver cancer and hematologic system tumors because of their targeting and unique biological effects to tumors. Antibodies act as guiding molecules, enriching effector cells and immune activation factors at the target site, thus playing a killing role. Antiviral infection: Recent studies have shown that humanized antibodies show strong advantages in the treatment of hepatitis, AIDS and other respiratory virus infections. At present, humanized antibodies against rabies virus, influenza virus and cytomegalovirus are also in the experimental stage. Anti-Alzheimer's disease: Alzheimer's disease (AD) is a refractory neurodegenerative disease and there is currently no clear treatment or prevention. Scientists have confirmed that the accumulation of β amyloid (Aβ) in brain tissue is the key to the pathological process of AD. At present, studies have shown that Aβ oligomers have obtained a certain therapeutic potential to improve cognitive impairment or to clear Aβ plaques in the brain, and have the application prospect of AD immunotherapy. Anti-autoimmune disease: Recombinant antibody drugs can inhibit excessive immunopathological responses against activation of inflammatory cells and release of cytokines. The use of antibodies for the treatment of rheumatoid arthritis, systemic lupus erythematosus, and multiple sclerosis is effective. In addition, recombinant antibody agents with anticoagulant and antiplatelet functions play an important role in the treatment of cardiovascular and cerebrovascular diseases. In summary, recombinant antibodies are products of the continuous optimization of traditional antibodies, which not only have the advantages of monoclonal antibodies but also make up for their shortcomings. As technology advances and innovates, scientists will learn more about recombinant antibody technology to maximize the potential of recombinant antibody drugs to make them more widely used in the prevention and treatment of related diseases.